Why are a chess champion and a dancing chorus line singing about a mad night in Bangkok? Who knows? Don’t worry; have fun. Photo Credit: Jay Yamada. “Chess,” obviously, is an unlikely subject for a musical. It finds its dramatic interest in a Cold War chess match between American and Soviet champions. The original production, based on a concept album, boasted book and lyrics by Tim Rice (of Superstar fame) and music by Benny Anderssen and Björn Ulvaeus of ABBA. It an three years in London but flopped on Broadway. Conneisseurs of the genre consider the album to be a classic, and why wouldn’t it be? Because ABBA. Because Tim Rice. When Custom Made’s artistic director, Brian Katz, began to investigate a possible production, he found many versions of the book and the score. Chess like variations, as it were. He also learned that Tim Rice had invited would be producers create their own version of the show, using the original concept album as a guide, and rearranging to their hearts’ content. Katz was hooked. Custom Made’s dramaturg, Stuart Bousel, reviewed multiple versions of the script and pieced together a playable result. Also, Mr. Bousel, a beloved director and playwright returns to the stage after nearly a decade’s absence to play a seriously mysterious CIA flunky. His mad cackle is a comic highlight. How do you create musical theatre excitement out of a chess match? While choreographing an unusually large cast in an unusually small space? Could Custom Made possibly win this game? Well, yes, they could and they have. The production wins us over from its opening number in which an ensemble of shopkeepers in Merano, Italy, dance about in enthusiasm over the chess match which they are sure (but why?) will make their community rich and famous. It is absurd and funny and utterly charming, due to the amusement of seeing this ridiculously large ensemble squeezed onto a tiny stage, and dancing. It’s like watching an elephant balancing on a beachball. Each member of the ensemble manages to create a full and humorous characterization—we instantly know this crowd. Rowan Rivers and Ted Zoldan, in particular, demonstrate the truth of the old adage about there being no small parts, only small actors. These guys are plenty big. The story is, frankly, confusing, but who cares? There is sexual intrigue, a mysterious CIA mystery man, a KGB guy with a wicked grin, and crazily neurotic chess players, one of whom bears a suspicious resemblance to Maxwell Smart. The music and the lyrics, are charming and sophisticated, which is no surprise given the bonafides of Rice and ABBA. How could it go wrong? It doesn’t. Custom Made has taken on a challenging piece, and wrestled it to a checkmate. Go, be confused, and surrender. You’ll have fun. “Chess” continues at Custom Made Theatre through October 29 (extended run). For further information, click here. Chess, music by Benny Andersson and Björn Ulvaeus, lyrics by Tim Rice, dramaturgy/book adapation by Stuart Bousel. Director: Brian Katz. Music Director: Armando Fox. Choreographer: Daunielle Rasmussen. Scenic Designer: Austin Kottkamp. Costume Designer: Brooke Jennings. Lighting Designer: Maxx Kurzunski. Sound Designer: Ryan Lee Short. Video Designer: Maxx Kurzunski. Properties Designer: Rachel Maddox. Cast: Forence Vassy: Leah Shesky. Freddy Trumper: Mischa Stephens. Anatoly Serievsky: Heather Orth. Arbiter: Alan Coyne. Molokov: Martin Bell. Walter: Stuart Bousel. TV Hostess: Juliana Lustenader. Ensemble: Katie Franciss, Toni Lynn, Buidry, Paul Hogarth, Rowan Rivers, Gabrielle Traub, Ted Zoldan. 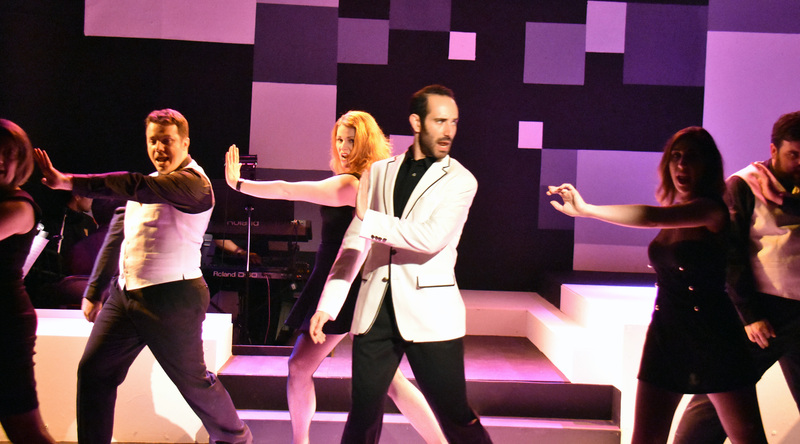 Posted in Reviews.Tagged ABBA, Benny Anderson, Björn Ulvaeus, brian katz, Charles Kruger, Chess, custom made theatre, Rowan Rivers, san francisco bay area theatre reviews, Stuart Bousel, Ted Zoldan, theatrestorm, Tim Rice.